M40 is a double star in Ursa Major ( the Plough ). Omitted from some catalogues as en erroneous entry, it may have been confused with the two larger galaxies in the image. 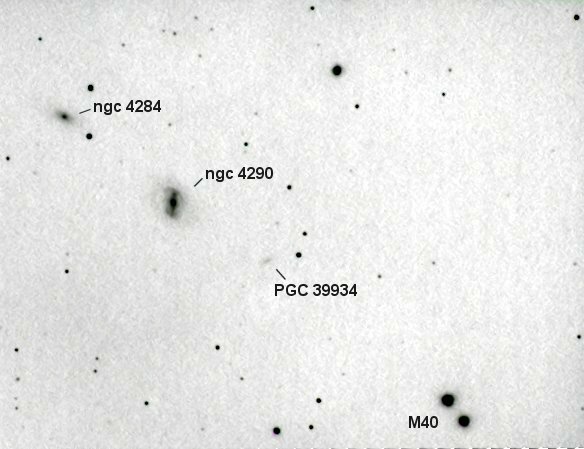 The lower right star is TYC 3840-01031-1 , mag +9.65 , adjacent to TYC 3840-00564-1, mag +10.65. NGC4290 is a double barred spiral magnitude +12.9 galaxy , NGC 4284 and PGC39934 are both spiral galaxies , with their magnitudes being +14.4 and +17 respectively. 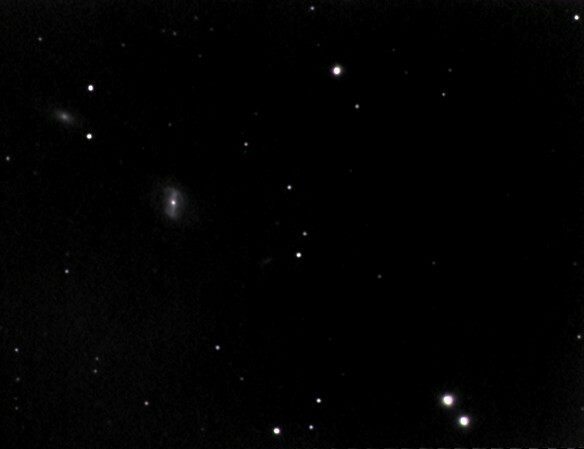 60 x 45 second exposures to bring out the double barred galaxy, which deserves imaging in its own right. Insufficient colour channels taken with this, so the image is a little pale. NGC 4290 appears to have some kind of irregular halo.